Description: This Buttonhole Clasp is a round or oval loop made with Vertical Larks Head knots. 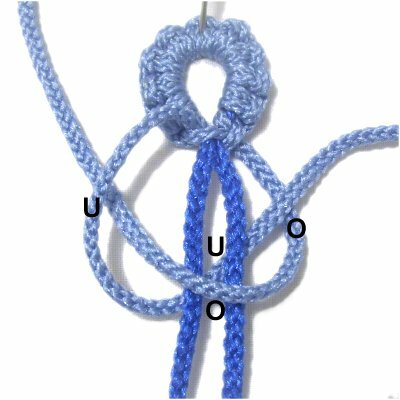 A Square Knot is usually part of the design, but other knots can be used to close the loop. This clasp is mostly used for jewelry, using material 1mm to 2mm thick. The images show 2mm size braided nylon material. 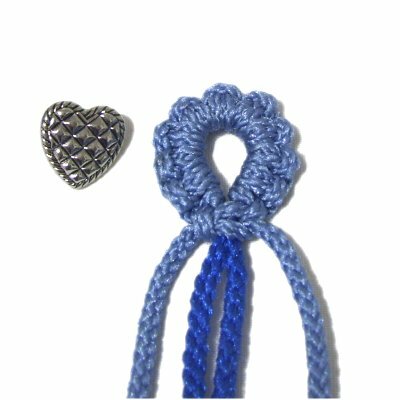 Please visit Jewelry Clasps to see other types of closures for Micro-Macrame designs. To make a very nice belt buckle using a large fancy button, all you need is 4mm material, to make the clasp design larger. Preparation: To practice the Buttonhole Clasp, you need one holding cord 18 inches long. Cut one working cord, 36 inches long. Secure both cords to your project board vertically, and place a piece of tape across the cords to mark the center. The working cord should be on the right. 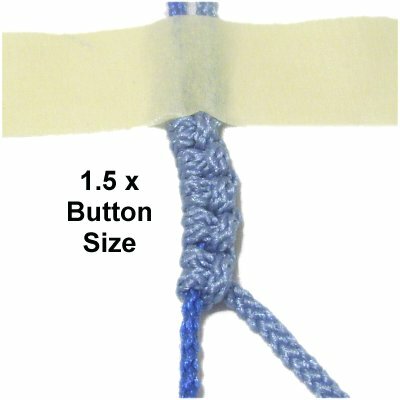 When using this technique in a Micro-Macrame project, the cutting lengths are usually much longer, since the cords are used to make the bracelet or necklace after the clasp is done. Step 1: Make the first loop for the Vertical Larks Head by passing the working cord over - under the holding cord, rotating clockwise. As you bring it to the right, cross over the working cord. Step 2: Tie the second loop for the Vertical Larks Head knot by passing the working cord under - over the holding cord. Pull it right, crossing under the working cord. 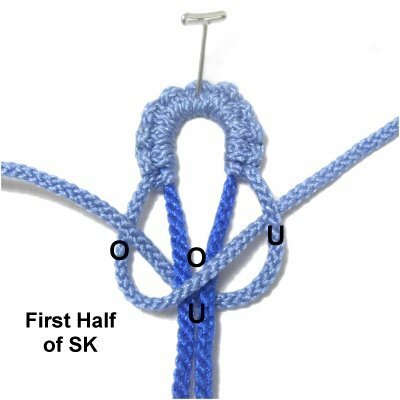 Steps 1 + 2 = one Larks Head knot. Step 3: Repeat steps 1 and 2 at least 3 times, until the sennit is 1.5 x the size of your button or bead. So for a 1/2-inch button, you need to tie enough knots to get to 3/4-inches. Step 4: Turn the first half of the design around, so the working cord is on the left. 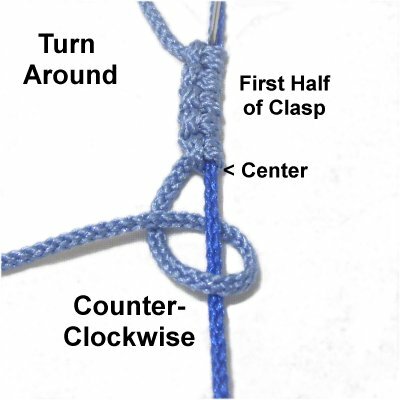 Start at the center and tie the same number of knots to make the second half of the clasp. Rotate counter-clockwise to make the two loops. Step 5: Form the Buttonhole Clasp by making a circle with the knots as you bring the ends together. Tie a the first half of a Square knot with the two working cords, around the holding cords. Step 6: Tie the second half of the Square knot with the working cords. 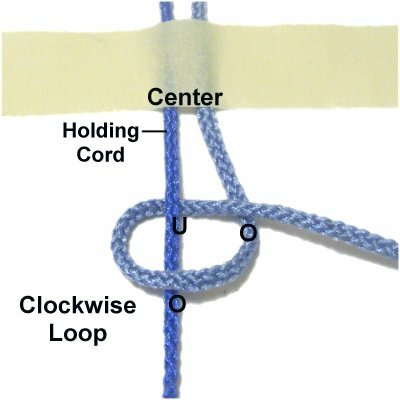 After you tighten the knot, pull on both ends of the holding cord to remove the slack between the knots. Step 7: Make sure the button fits through the opening, then attach it to the other end of the design you are making. 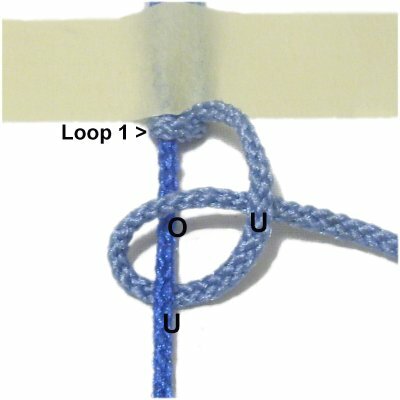 You can also use a bead or button knot to form the closure. Have any comments about the Buttonhole Clasp? Contact Me.